A week or so back, I got a wonderful note from a woman in Connecticut named Nancy Noonan. Nancy's 34-year-old daughter-in-law in San Francisco, Cynthia, had recently be stricken with Transverse Myelitis and is currently a C5/T1 paralytic. 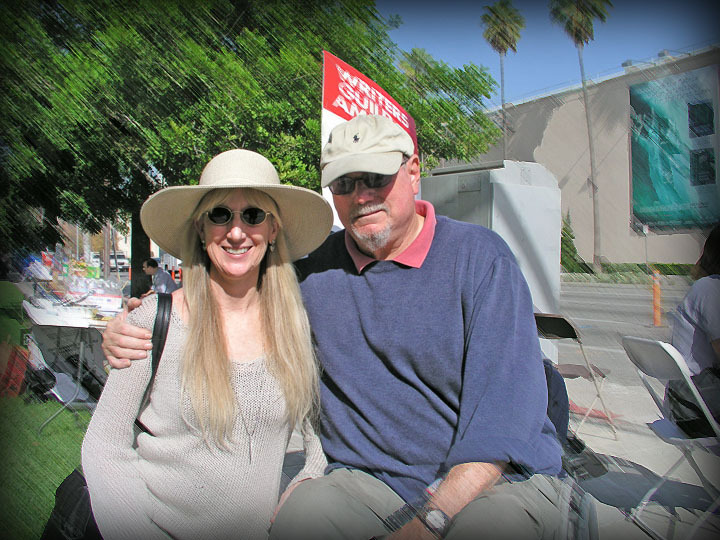 Nancy asked me if I'd be willing to come up to San Francisco on Saturday, December 8th, to be part of a community fundraiser for Cynthia and her husband, Trevor. So I'll be there, for sure, signing books and whatnot. The wonderful people at Book Passage in SF are donating books for the occasion. If you live in the area, please drop by and add your support. The event is at a tavern called Liverpool Lil's, located at 2942 Lyon @ Lombard in San Francisco. The phone is 415.921.6664. The event is from noon til five. Remember, Saturday, 12/8, Liverpool Lil's. See you there. 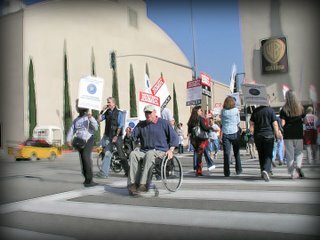 Photos from the picket line yesterday in front of Warner Bros in Burbank. 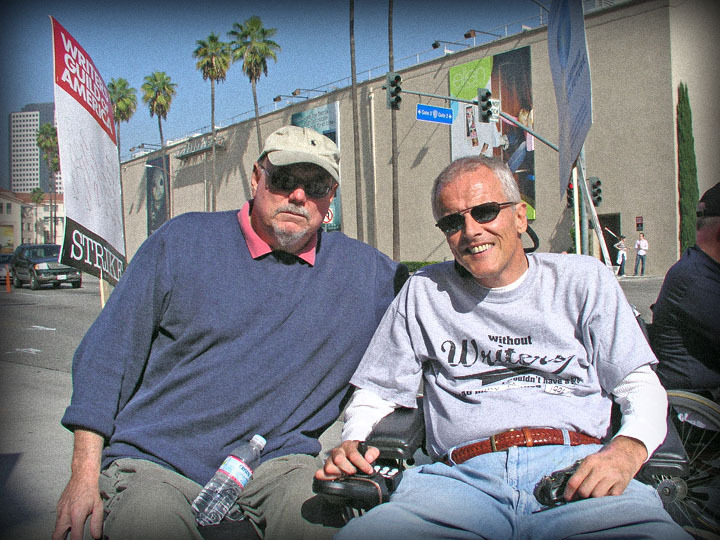 Performers with Disabilities (PWD) joined writers with disabilities (WWD) and many others. One pic is with actor/activist/pal Danny Murphy and one is with Down syndrome maven Gail Williamson. A rousing good time of political oneness was had by all. 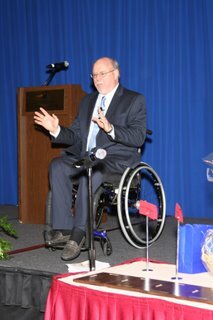 Thanks intrepid photog Marty Sweeney for the pix. Then please send it on to anyone who has ever watched an American movie or TV show. Is that asking too much? As usual, your comments and suggestions are always welcome here at allenrucker.com. In fact, we live for them. Thanks. If you want to know what the Writers Guild strike in Hollywood and New York is all about, it's about money. The six giant corporations that control virtually all of broadcast and cable television and feature film distribution want to keep all of the money generated by new media like the Internet and podcasting and watching "The Office" on your telephone, etc. Under their plan, the writers who write all the shows that appear or re-appear on those new outlets get nothing. Nada. It's billions for them versus pennies for writers. To learn more, watch this video on You Tube. My friend Dub Cornett's documentary about three country boys who found an object at Goodwill which allows them to communicate with God -- the hallowed URIM & THUMMIN -- has recently been accepted at the prestigious International Documentary Festival in Amsterdam. Go to the Urim & Thummim website -- http://www.utmovie.com/UT%20Website/Welcome.html -- and watch the trailer. You can also go to the IDFA site -- http://www.idfa.nl/en/ -- to check it out. Dub is headed to Amsterdam to sit on a panel with Werner Herzog, a fan of the film. This is absolutly mind-blowing stuff -- outsider reality, as it were -- something Dub specializes in. These boys have located a spiritual icon of the ages. Flannery O'Connor could have written this story. Think "Wise Blood" centered on a sixty-nine cent curio through which believers have mystic visions. This is exactly how Mormonism got started and now we have a Mormon running for President. To all dis-cogniscenti: check out the current issue of ABILITY Magazine, just out, for fine pieces on the soon-to-be-released movie, "Music Within," all about the rise of the disability movement leading to the ADA; the rise of MS in children; and my own contribution, a rant about the invisibility of the disabled called "Stuck At The Starting Line." Actor Ron Livingston is on the cover. 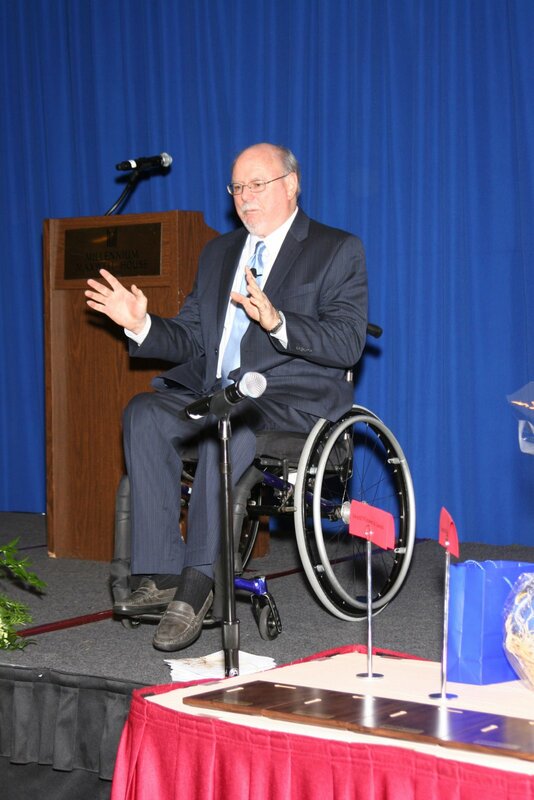 The pic is me speaking at the Goodwill Industries gala in Nashville. Nice suit, huh? Thanks again to David Lifsey and company for a great time.